Pi Day (March 14th) has always been a special date to MIT. It is celebrated on March 14th because 3.14 are the first digits of the irrational number π. Every year MIT announces its admission results for the upcoming undergraduate class on this day. It is also MIT’s annual giving day, during which MIT students and alumni come together to support the institute to help expand educational resources to empower learners worldwide. This year, as usual, the EECS GSA has thrown a “pie” party for fellow EECS graduate students to celebrate this event. 24 whole pies of different flavors were ordered from Petsi Pies were and Flour Bakery, with vegan and gluten-free options as well. A lot of students showed up at the event and enjoyed the delicious pies with friends at the 8th-floor cafe of RLE. Shout out to Mina Dalirrooyfard (in front), who helped organize the event with our social VP Social Farnaz Jahanbakhsh (not in scene). 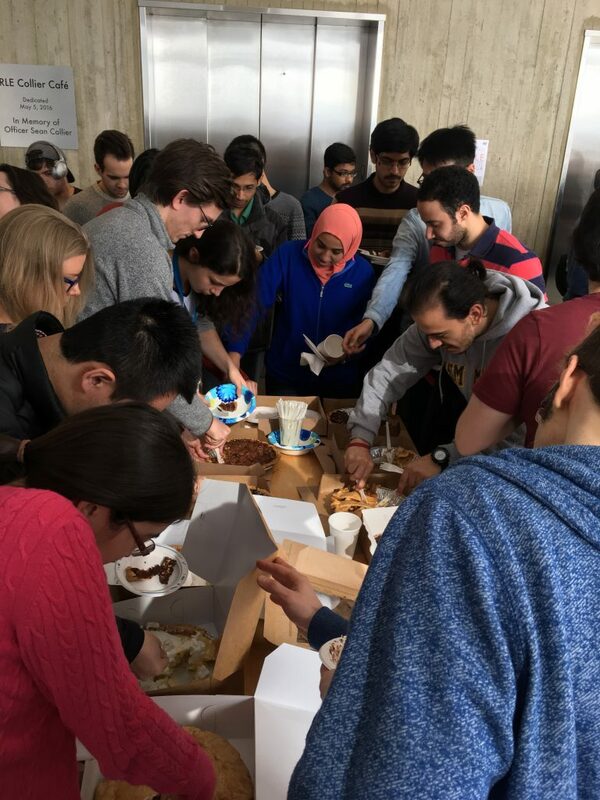 EECS graduate students enjoy slices of pie with friends at the 8th-floor cafe. At the 2018 EECS GSA elections, graduate student members elected a new slate of officers to lead the GSA in 2019. Congratulations to the new officers! The term for new officers begins January 15, 2019. We look forward to a great year! The EECS Graduate Student Association has announced elections and a call for officer candidates for the term beginning January 15, 2019. The elections will be held on Wednesday, December 5, from 6pm to 7:30pm in room 32-D463 (Star Room). Dinner will be served. Officer nominations are now open! All MIT EECS graduate students, including MEng students, are eligible to nominate or be nominated. To secure a nomination, you must be nominated by at least two EECS graduate students; self-nominations are encouraged. Candidates are highly encouraged to submit a short personal statement to be posted on the GSA website prior to the elections. Please submit nominations by email to eecs-gsa-advisors@mit.edu by December 5. The EECS GSA is seeking three executive board members for the remainder of the current term (until December 31, 2018). Interested in joining our executive board? Looking to give back to the larger department community? Consider joining us for the current term. This is also a great opportunity if you are interested in running for any position on the EECS GSA Executve Board in 2019 in order to familiarize yourself with the organization and the roles. If you are interested, please contact eecs-gsa-president@mit.edu. The beginning of another academic year always brings with it the eager shouts of a new cohort of PhD students joining our ranks. Welcome new students! 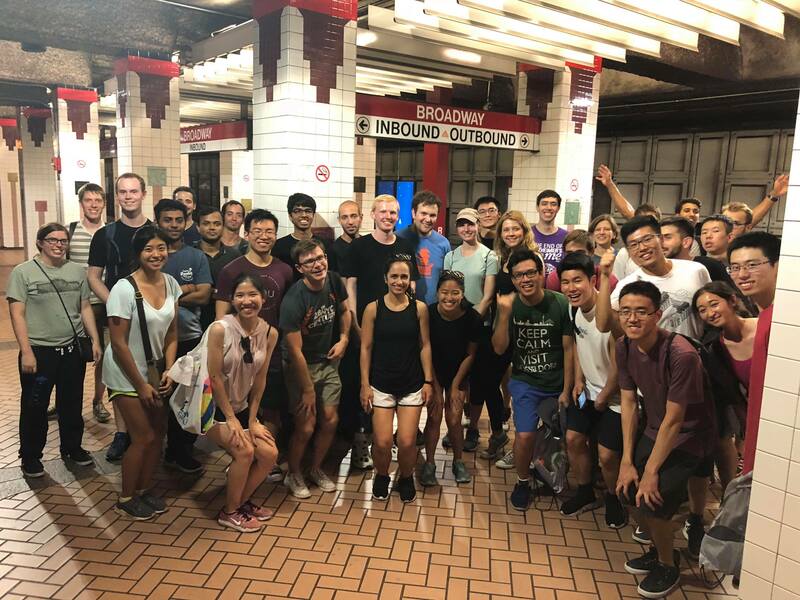 The EECS GSA hosted a variety of orientation activities to get our fellow students up-to-speed on the MIT PhD experience and Boston living… and hopefully meet a few friends along the way. Check out some photos of our events below. 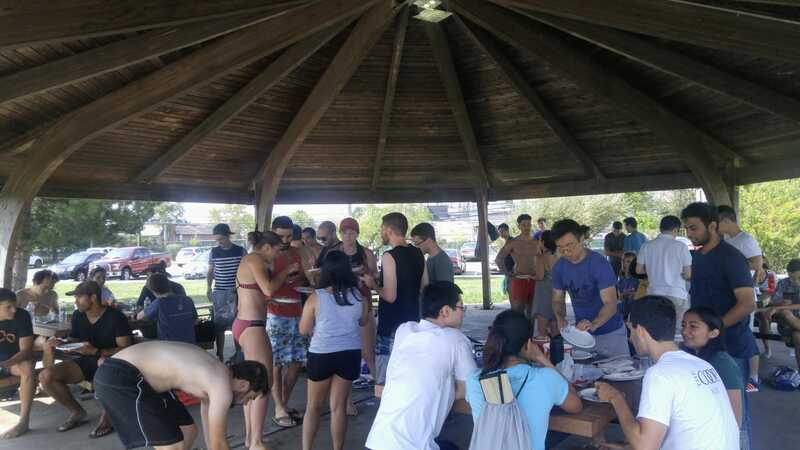 EECS GSA Orientation activities included a board games and sushi social, a frisbee and cupcakes social, an Insider’s Guide to the PhD, Cambridge pub night, a beach outing, a rock climbing outing, and a How to Communicate in Grad School panel. One of everyone’s favorite orientation week events is our outing to Constitution Beach in East Boston. Students enjoyed a picnic lunch and a day of games and waves to unwind after a busy first week on campus. If this ends up being the only time you go to the beach in Boston during your entire PhD tenure, then rest assured it can’t get better than this! Those forearm muscles look great! Are they from the climbing gym or from mashing code at your keyboard? 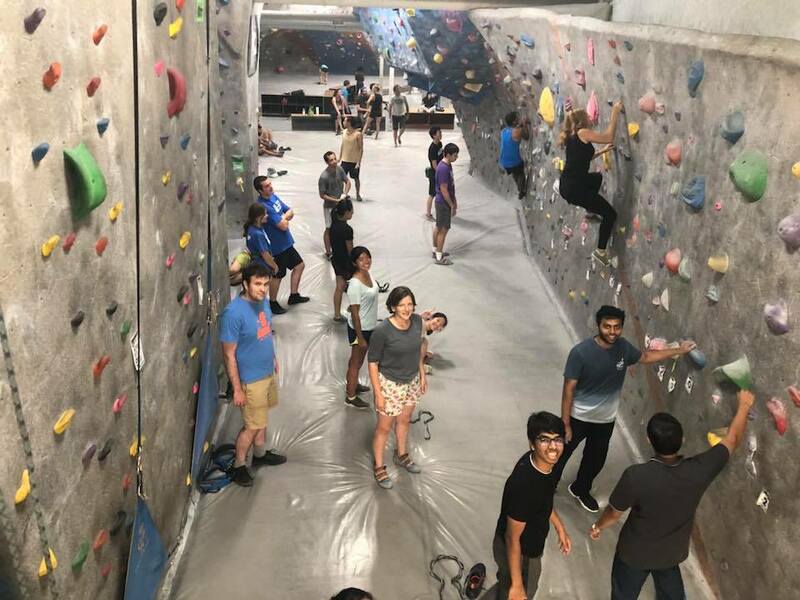 It didn’t matter to first year students as they scaled the walls at Rock Spot Climbing in South Boston. Make sure to follow the EECS GSA for more social and academic events like these. watch this page for more blog posts! 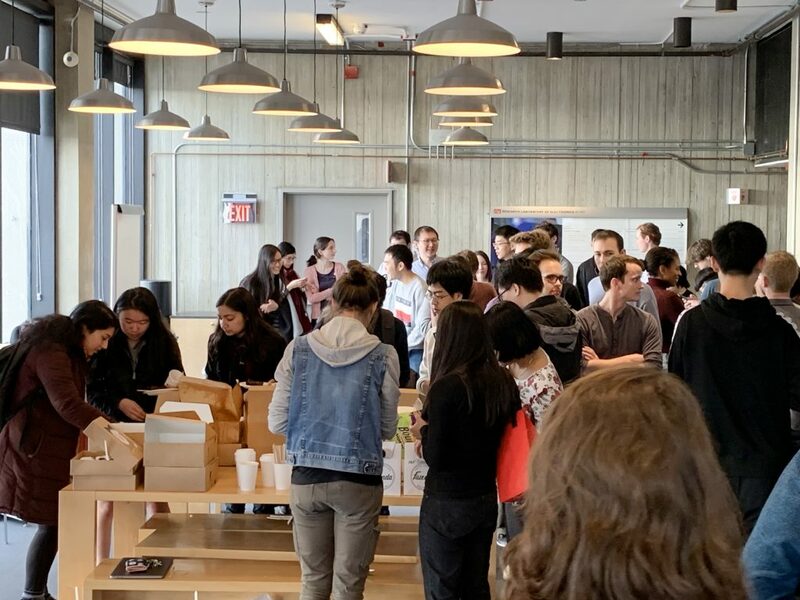 As MIT EECS graduate students begin to study for final exams, prepare course projects, submit research papers, and write up results in Masters and Doctoral theses, the EECS GSA has held several events to put students in the right mindset. 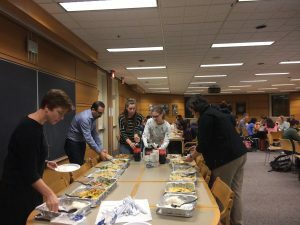 In March, EECS GSA and EECS REFS cohosted a wellness dinner for students to learn and discuss with each other how they tackle stress and stay fit while keeping up with the demands of research. Speakers included representatives from EECS GSA, EECS REFS, VPR, Physical Education, Community Wellness, and Title IX. Then, we heard from Professor Vivienne Sze at the latest installation of our Faculty Dinner series. 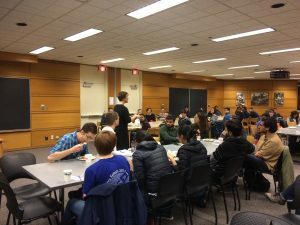 Professor Sze shared insights on her unique path to academia, the transition from an industry career to a faculty position, and her advice for graduate students to make the most of their training. 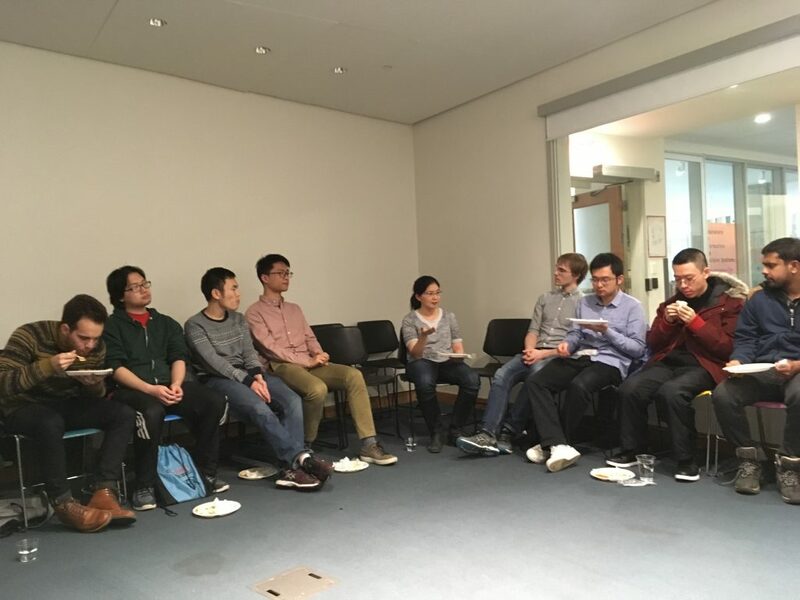 Professor Vivienne Sze (center) chats with students at a Faculty Dinner series event in April 2018. 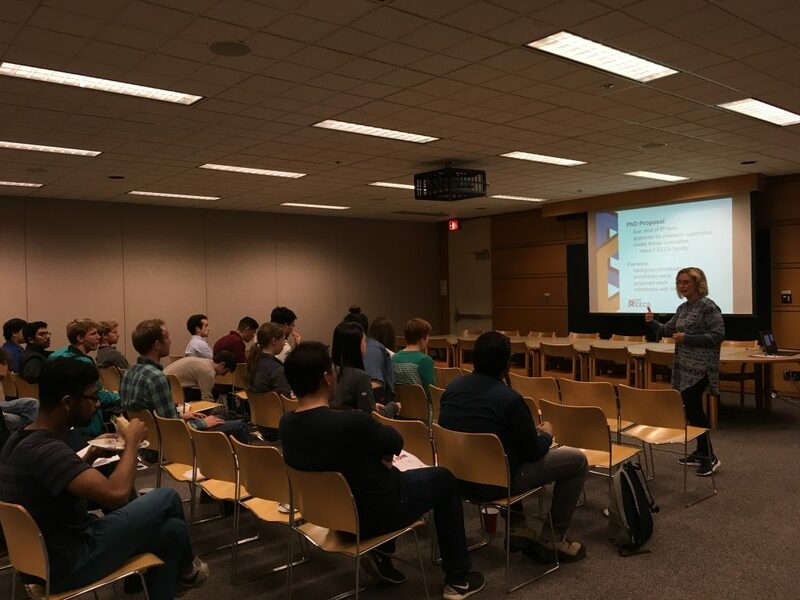 EECS Graduate Officer Professor Leslie Kolodziejski speaks at the EECS GSA Thesis Panel in April 2018. Stay tuned for more academic events from the EECS GSA! The digits of π begin with 3.14… and if you’re reading this, you can probably name the next 50 as well. 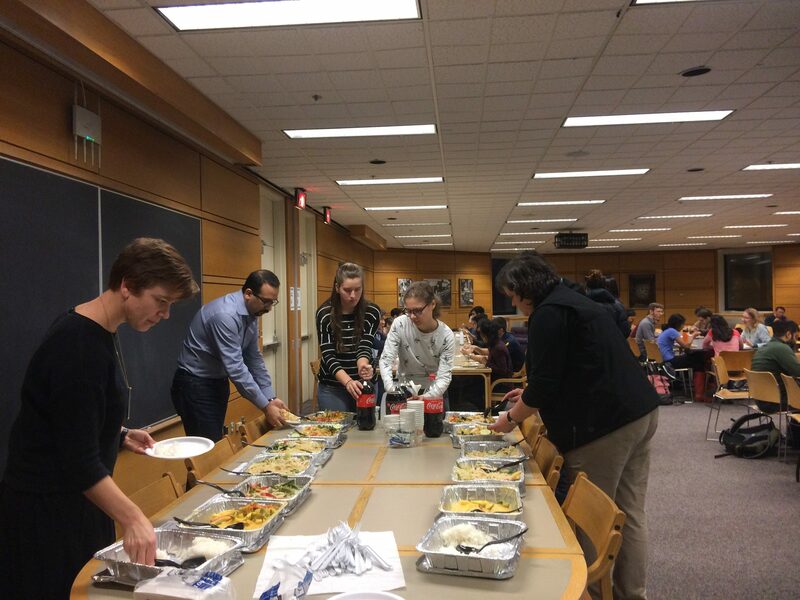 This March 14th, (3/14), EECS GSA hosted a Pi Day celebration featuring over 20 pies from local favorite Petsi Pies. Timeless favorites like Apple, Pumpkin, Banana Cream, and Chocolate Bourbon Pecan were served, as well as gluten-free and vegan choices. After an initial rush in which students maneuvered to get a slice of their favorite pie, the delectable desserts where quickly consumed. 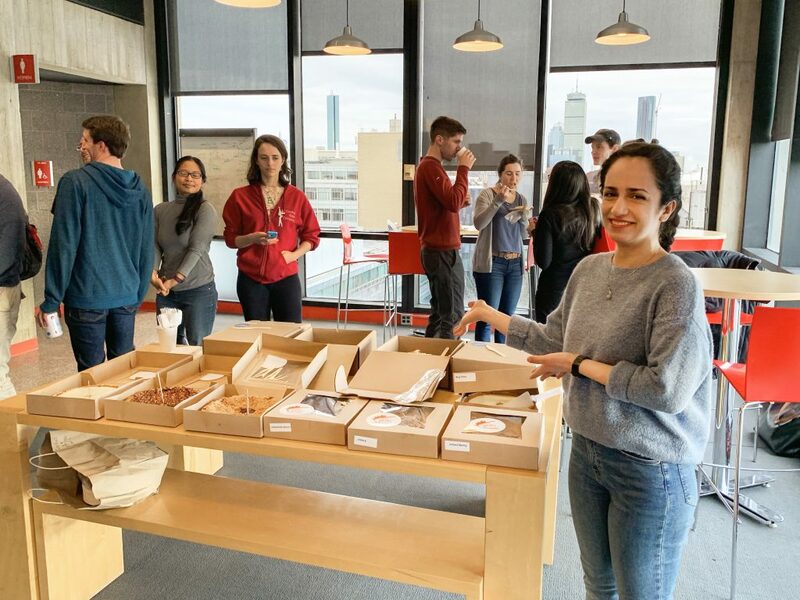 The annual Pi Day celebration brought over fifty students to eat pies from local bakery Petsi Pies. 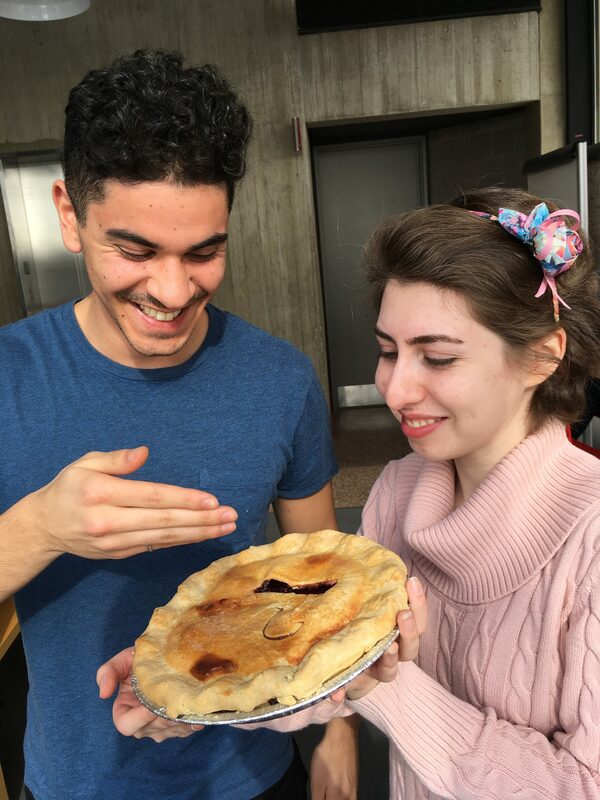 EECS GSA Co-President Maz Abulnaga (left) and VP Social Farnaz Jahanbakhsh (right) rejoice in the wafting scent of a Apple Pi Pie. 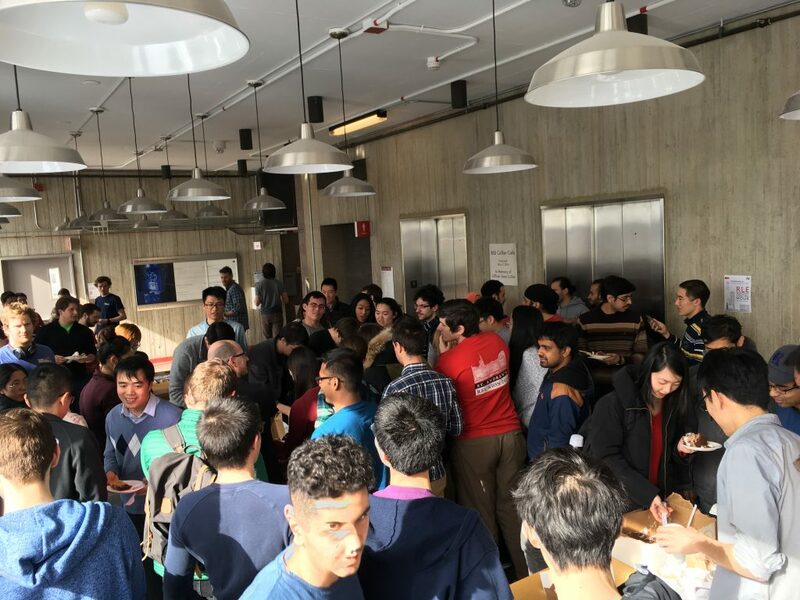 EECS students made a mad rush for the first, decadent slices. 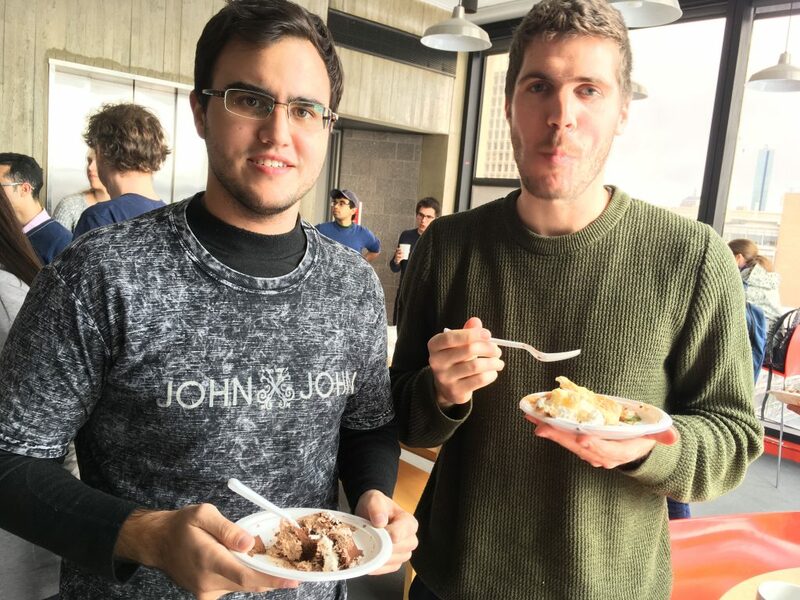 EECS students enjoy slices of pie. It’s not far into the semester, but we still thought you might be in need of chocolate. 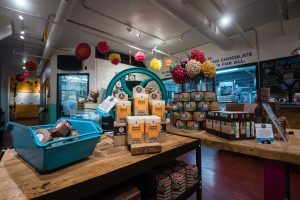 The EECS GSA is organizing a tour of the Taza Chocolate factory store on February 20, 2018. Yes, there will be sample tastings! For further questions, email Farnaz Jahanbakhsh, VP of Student Life. Head over to the elections page for more information about how to get involved!